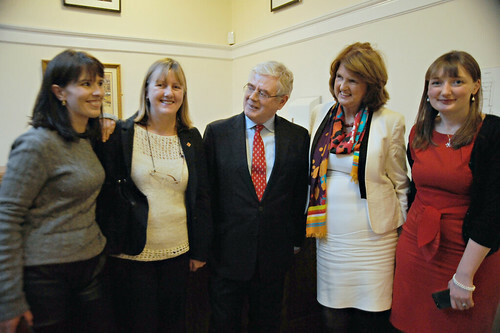 The Labour Women annual conference took place in the Mansion House on Saturday February 1st. Although the main business of the day was motions and the election of a new executive, we also had panel discussions and several very special guests. This year we also used a “Twitter Wall’ for the first time and the whole conference was live tweeted by executive member Catherine Rotte Murray. This years conference was generously hosted by Lord Mayor Oisin Quinn who welcomed delegates to the Mansion House and highlighted our excellent record in terms of selecting women candidates for the upcoming local elections. The next business of the day was the chair's report and this gave us the opportunity to tell delegates about the work done by the outgoing executive. Highlights of the last two years included a conference on the theme of ‘Equality in the 21st Century’ held in conjunction with PES women to mark Irelands presidency of the EU, our centenary event marking the contribution of women over the 100 year history of the Labour party and the Labour Women Bootcamp, a training day for women candidates in the upcoming local elections. In the morning session , Emer Costello MEP and Patricia King of SIPTU joined us for our ‘Women in Public Life’ panel. Both gave lively accounts of their experiences as women in the public eye. The final event of the morning was an address by Tanaiste Eamon Gilmore who outlined his commitment to involving more women in politics. The afternoon session kicked off with the presentation of the inaugural ‘Rosie Hackett Award’ to the Dunnes Stores Strikers. 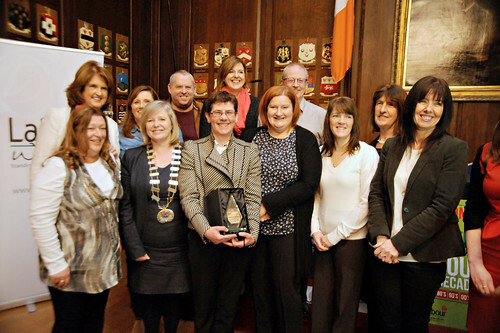 The award was presented to the group by Minister Joan Burton who linked the extraordinary sacrifices made by the 12 strikers to the sacrifices made by the workers involved in the 1913 lock out and highlighted the need for a strong framework of workers rights and the introduction of a living wage. We were also delighted that the women and men involved took the time to answer questions from the floor about their experiences and many of the women who attended the conference talked about how they were inspired to political action by the strikers. In the afternoon we got on to the important business of motions and debated issues from the right to housing to the marriage age. Conference mandated the incoming executive to campaign on a diverse range of issues including repealing the 8th amendment and improving maternity services. The debates ran smoothly and efficiently with the help of our excellent standing orders committee of Niamh Hayes, Irene Shelly and Karen Mc Cormack. With their help all of the business of conference was attended to with enough time to enjoy a post conference social reception. The reception gave delegates a chance to catch up with other members and continue the debate. Overall the day was a huge success and I would like to thank all of the delegates for their contributions. I would also like to thank all of those who gave their time on the day including our standing orders committee, Party Chair Lorraine Mulligan, Party Leader Tanaiste Eamon Gilmore and Deputy Leader Minister Joan Burton. I would also like to thank the many staff that gave up their Saturday to ensure the smooth running of the conference including Shauneen Armstrong as well as Claire Power and Elaine Deegan from the Research office, and women’s and equality officer Billie Sparks. I am looking forward to the years ahead and to working with the new executive. We've more images from the day on Flickr which you can see from this link.